Methyl Hydrate, also known as gas line antifreeze (similar to wood alcohol), added regularly to fuel tanks is an excellent way to prevent condensation from freezing and clogging gas lines on vehicles in winter. Truckers and equipment operators use it as an air dryer for air brakes. You can buy them in small, 1 ounce containers but they’re expensive in small sizes for the little you get. I buy it in gallon jugs that last several winters. I keep a small container in my vehicle and refill it from the gallon jug I keep at home. Warning: the plastic jug sprung a leak after several years. I suspect the plastic jug was never intended for long term storage and the fluid corroded the plastic. 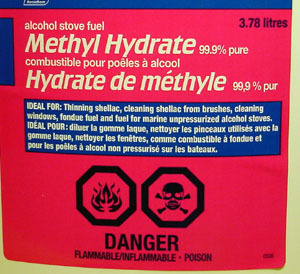 This is dangerous because Methyl Hydrate is very flammable; after all it’s used in alcohol fuel stoves and fondue pots. In future, I’ll store it in glass containers after about a year or so. All it would have taken is one spark … so beware. Update: different grades of gas have different levels of ethanol. Premium should have none or very little. Mid-grade up to 5% and regular gas can have between 5% to 10%. Conclusion: you don’t need Methyl Hydrate if you use regular or mid-grade gas but you still need it for premium gas. This entry was posted in Hints and Tips and tagged gas line antifreeze, methyl hydrate, wood alcohol. Bookmark the permalink.